Context: Immediate after we see all the principle actors in the film get their heads completely shaved, we get introduced to everyone’s favorite drill instructor, Sergeant Hartman (R. Lee Ermey). Why is it great: Who can argue with one of the fullest, richest performances of an actor’s career? It’s hard to believe Ermey improvised a lot of his dialogue as well as required very few takes. Both of which were almost unheard of with this particular director. It is truly great when you listen to the litany of insults he hurls at his men, knowing most of it was made up on the top of his head. Ermey was not even supposed to get the role and serve as consultant only. 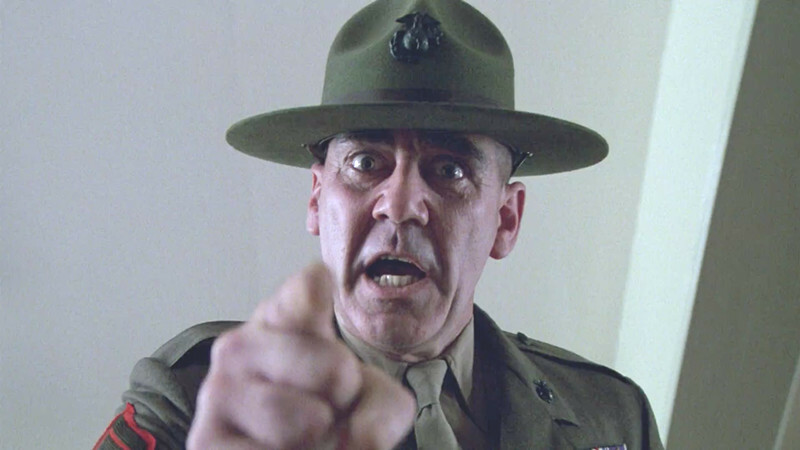 Kubrick was convinced after viewing a videotape of Ermey yelling insults over an extended period of time. Context: After viewing a cheesy scratchy 70s homage title screen which says “OUR FEATURE PRESENTATION”, you hear only heaving breathing followed by a close up black and white shot of our bloody, battered heroine (Uma Thurman). Offscreen, Bill (David Carradine) says his initial lines to the beaten bride as she lie on the ground, wiping some of the damage from her face. She barely gets out her last line of exposition before receiving a shot to the face before the credits roll. Why is it great: Since “Kill Bill” is a revenge film, what better way to begin that show the action and dialogue which causes the two-film retribution from the get go? 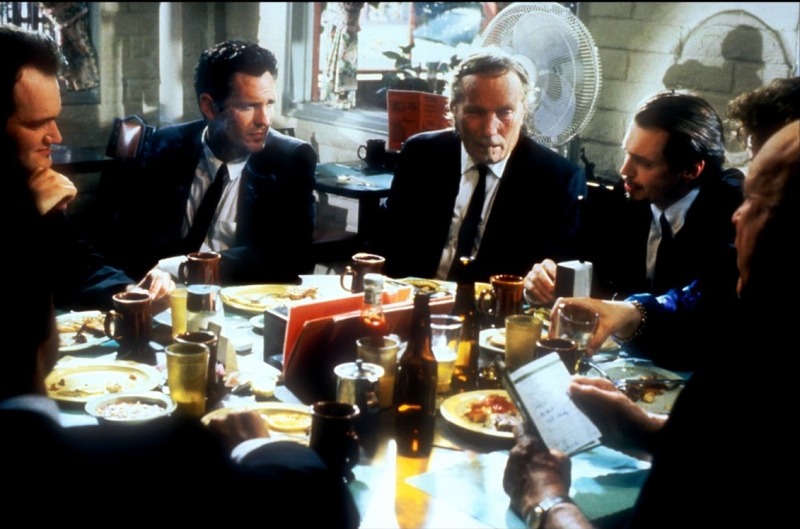 Unlike other Tarantino films, this one starts with dialogue which is immensely important to the narrative immediately. You can feel The Bride’s desperation and agony as she awaits her fate. If Bill wanted to finish the job, he should have had better aim or used just one more shot! Context: We just finished viewing the opening credits and seeing the name of the director Alfred Hitchcock against a backdrop of a cloud-covered moon in the night sky while listening to the score of Franz Waxman. 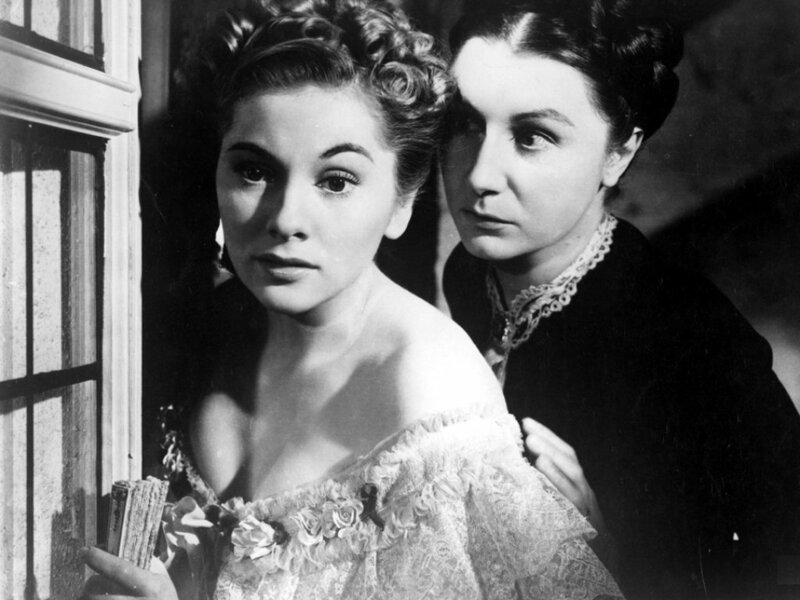 Why is it great: Since it is the first line of the film, you don’t yet know anything about Mr. or Mrs. de Winter (Lawrence Olivier and Joan Fontaine) and their downhill relationship when Mrs. de Winter starts learning about the mysterious life of her husband’s newly deceased first wife, Rebecca. The line is great only because it puts us in the mood for what’s to come as only Hitchcock could do. It opens our minds to the possibilities of a complex woven story which interests us from the moments it begins. 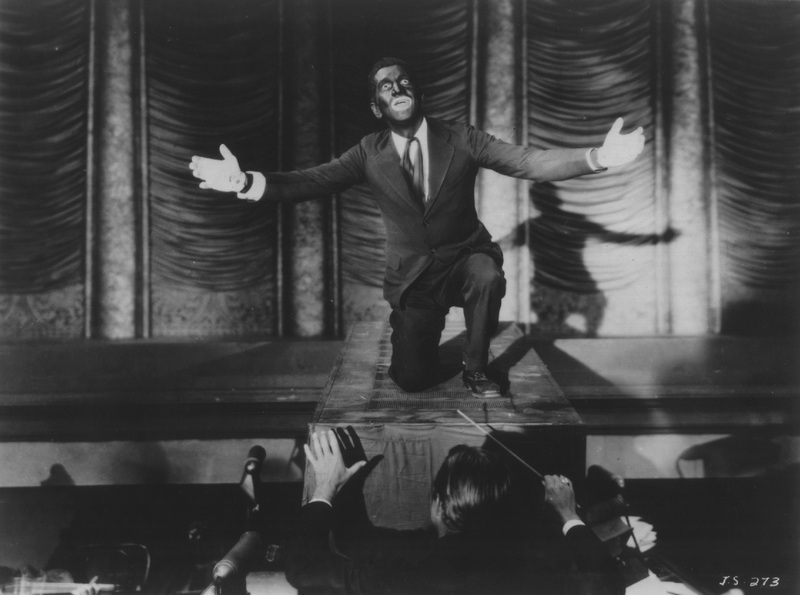 Context: At Coffee Dan’s eating and dancing establishment, Jakie Rabinowitz (Al Jolson) gets up to entertain the crowd performing the song “Dirty Hands, Dirty Face”. After his performance is completed, he addresses the audience and tells them there is more to come. Why is it great: While not the first words presented in the film, the line itself marks the first “synchronized” dialogue in a major motion picture ever making it the first of its kind. The historical significance of the film, scene and line itself are second to none and changed the film industry forever. “The Jazz Singer” marked the beginning of the decline of silent films in favor of “talkies”. Context: You hear the Sons of the Pioneers classic tune “Tumbling Tumbleweeds” begin to play as the film opens. You see a shot of scrolling desert as The Stranger (Sam Elliott) begins to tell the audience about the movie’s unusual, laid back main character. 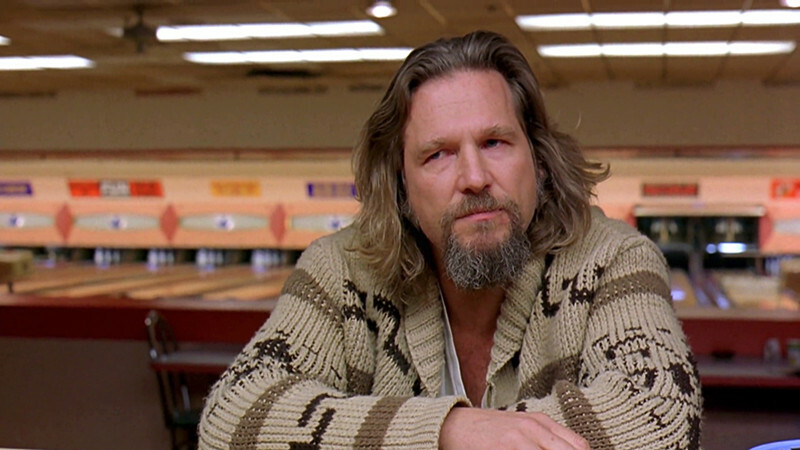 A tumbleweed itself blows through the scene and continues to “tumble” until we see “The Dude” (Jeff Bridges) standing in his bathrobe at a convenience store drinking a quart of half and half and paying for it by check. Why is it great: The introduction by The Stranger is apt and sets the mood for the film quickly. Lebowski’s insistence on being called by his nickname is important to the plot and humor of the events which unfold and gives quick introduction. It ties the film together and gets us ready for events to come. 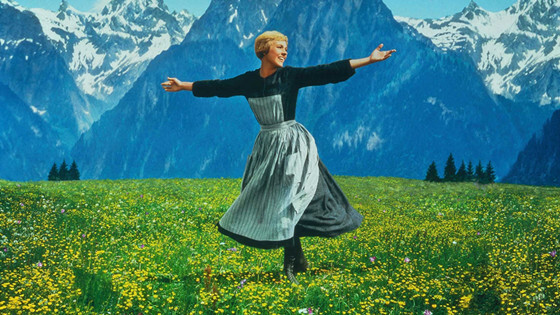 Context: The Salzburg, Austria landscape never looked more lush, beautiful and majestic as we see Maria Rainer (Julie Andrews) spinning and singing the film’s opening song in the center of a large prairie mountaintop. It is lively, upbeat and immediately puts everyone watching in a good mood. Why is it great: One of the best opening songs in film history, the title song for “The Sound of Music” still delights to this day and serves as a superb introduction to Maria and her positive attitude and lust for life. Her smile is contagious for sure and the audience is captured right away. She will need this attitude quickly when she gets her first job as a governess to the lively children of Captain Georg von Trapp (Christopher Plummer). Context: Even before we see the soon-to-be diamond robbers in action, we hear writer, director and Mr. Brown (Quentin Tarantino) utter the first words of dialogue ever spoken in his first film. This particular conversation discusses everything from Madonna and the meaning of her 1984 hit single to the proper etiquette for tipping waitresses and what they may have to do to earn that extra dollar. Everyone seems to have their own strong opinion. Why is it great: Unlike “Kill Bill”, this dialogue does not serve to further the plot and only exists to help us get to know the main characters, their reactions and attitudes. It helps us get a sense of how they will react in certain situations and how they may conduct themselves if things do not go as planned. You can often learn a lot from someone not by what they say, but how they say it. Context: A completely red title screen begins the film. Then blue. Then red again for the title. We also hear the haunting score by Wendy Carlos begin its etude which is repeated many times throughout the film. 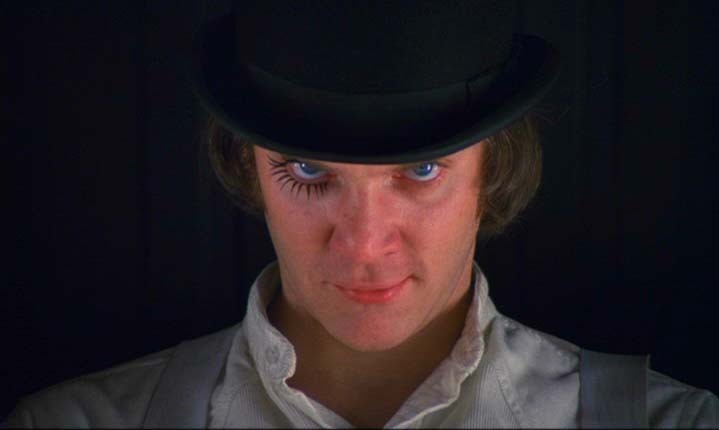 The camera then cuts to smirky antihero Alex DeLarge (Malcolm McDowell) complete with fake eyelash, bowler hat and white clothing ensemble. He sits alongside his compatriots sipping his milk getting ready for a night of torment and mayhem. Why is it great: Pretty much every element of the first shot/scene of “A Clockwork Orange” is perfect including the musical score, the slow camera pullout revealing the crowded eclectic mixture and people and sculpture in the futuristic setting as well as the dialogue itself. It perfectly established the world in which these characters live and the journey you are about to take with them.